This month, I shall continue my series comparing the two Disneylands closest to my heart (California and Paris) by looking at the carousels. In California, this is called King Arthur Carrousel, whereas the Paris equivalent is called Le Carrousel de Lancelot. Both are situated directly behind the Castle, although the California equivalent did not line up with Main Street properly until the 1983 refurbishment. The two attractions feature titles based on the legend of The Sword in the Stone, although the 1963 Disney film of that name does not feature the character of Lancelot. 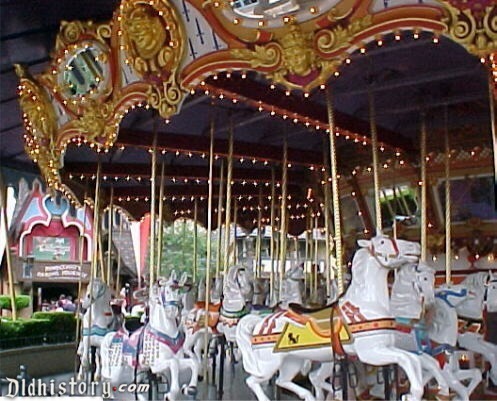 (As with Anaheim's Sleeping Beauty Castle, the California carousel was built and opened before the completion of the film on which it was based). Other similarities include: both run at speeds of 4.4mph with flexible durations; the horses always ending their rotation at the same location (and height) as they started; a soundtrack consisting of looped Disney music lasting two hours; and leaping horses, as opposed to the more traditional funfair style without bent knees. Differences between the carousels include: the shape of the queue-line (which in Paris is shaped like a Hidden Mickey, but is easier to jump); the Paris ride being built by Disney whereas the Anaheim one had been built by Dentzel in 1875; the nine hand-painted panels in California telling the story of Sleeping Beauty whilst those in France tell that of The Lady of the Lake; the number of horses operational at any one time (currently 68 in Anaheim; 86 in Paris); and the colors. In 1975, all the horses on King Arthur Carrousel were painted white; whereas Le Carrousel de Lancelot features horses of many different colors. In both versions, the outer row of horses is polished more thoroughly, although (in Paris), the horses furthest from the center are also wearing armor. Both versions use the French spelling of "carousel" (with a double-"r"), which is also favored by Florida's Prince Charming's Regal Carrousel (formerly Cinderella's Golden Carrousel) and Tokyo Disneyland's Castle Carrousel. The traditional spelling is used for King Triton's Carousel of the Sea in Disney's California Adventure, Hong Kong Disneyland's Cinderella Carousel and Tokyo DisneySea's Aladdin themed Caravan Carousel. All seven were opening day attractions, and all are "true" carousels, in that they turn counter-clockwise. If they turned clockwise, they would be Merry-Go-Rounds. The belief stating the former only features horses is purely a myth; when King Arthur Carrousel was first purchased from Sunnyside Park in Toronto, which closed the year Disneyland opened, it originally featured other animals, including giraffes and deer. Obviously both the Carousel of Progress and the Carousel Theatre are spelt the traditional way, whereas the short-lived Once Upon a Carrousel used the French spelling. Both King Arthur Carrousel and Le Carrousel de Lancelot have an adjacent area set aside for seasonal performances of The Sword in the Stone Ceremony. This has occurred in California since 1983, and Paris since the park first opened, although in the latter these shows are becoming much rarer, and have been missed out completely some years. Both versions of this ceremony follow the same procedure, whereby Merlin asks a burly Guest to help him remove Excalibur from a stone to find a "temporary ruler of the realm to safeguard and protect the Kingdom while good King Arthur is on vacation". Obviously, the Guest fails, and then a child tries, succeeds and is given a certificate and a medallion. The script for the two is practically identical, and so both run at just under a quarter of an hour, with Merlin usually staying around for a while afterwards to sign autographs. The Paris version features dialogue in both English and French; the piece is perhaps less gender neutral than the Anaheim ceremony, with potential female rulers being selected much more often than males. Both versions feature doves, wigs made from synthetic hair (which can thus go in the washing machine between shows), and crowns temporarily worn by children, which are washed after every show in case of lice. For this reason, both Paris and California each have three beards, three wigs and three crowns. Paris has never featured a band with Merlin; he has always performed solo, unlike the equivalent in Anaheim which was accompanied by a five piece band, The Make Believe Brass, until 1994. The ceremony remains popular in California, whereas in Paris the area is now used for other things, such as meet and greets, and Once Upon A Time (based on Sleeping Beauty), a fifteen minute stage play during which the set is ignored and an oversized book is leant upon the sword. On the whole, due to the reverence given to the Sword in the Stone Ceremony, and the history of the horses on King Arthur Carrousel (which is so lengthy that it could only be touched on in this article), I much prefer the California version of this section of the park.